New York: Simon & Schuster, 1977. First edition. Octavo, original cloth. Signed by Roger Angell on the title page. Small stain to the bottom page edges, near fine in a near fine dust jacket. 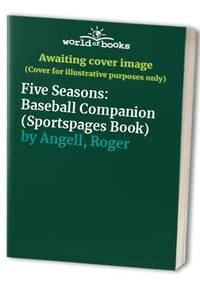 Five Seasons covers the baseball seasons from 1972 through 1976, described as the "most significant half decade in the history of the game." The era was notable for the remarkable individual feats of Hank Aaron, Lou Brock, and Nolan Ryan, among others. It also presented one of the best World Series of all time (1975), including still the greatest World Series game ever played (Game Six). Along with visiting other games and campaigns, Roger Angell meets a trio of Tigers-obsessed fans, goes to a game with a departing old-style owner, watches high-school ball in Kentucky with a famous scout, and explores the sad and astounding mystery of Steve Blass's vanished control. Simon & Schuster. Near Fine in Very Good dust jacket. 1977. First Edition; First Printing. Hardcover. 0671227432 . Blue cloth titled in yellow. First edition with full number line flat signed by Angell to the ffep. Crown slightly bumped, tiny rubbed spot to top edge. Tight and square, one mild spine gap. The DJ in mylar is creased to backstrip, lightly edgeworn/rubbed and lightly soiled. ; 8.7007873927 X 5.49999999439 X 1.40157480172 inches; Signed by Author . Warner Books Inc, 1983-04-01. Paperback. Used:Good. Fireside. PAPERBACK. 0671656929 New Condition. . New. Bison Books. PAPERBACK. 0803259506 New Condition. . New. Fireside. PAPERBACK. 0671656929 Like New Condition. . Fine. Bison Books. PAPERBACK. 0803259506 Like New Condition. . Fine. NY: Simon & Schuster, 1977 staining and discoloration to dj; boards in good condition, binding tight, content clean. Hardcover. Good/Acceptable. NY: Simon & Schuster, 1977 Edgewear and creasing to dj; bottom corner of boards slightly bumped; some foxing to page edges; content clean. First Edition. Hardcover. Acceptable/Acceptable. Bison Books. PAPERBACK. 0803259506 Special order direct from the distributor . New. Paperback. New. Covers the baseball seasons from 1972 to 1976, described as the &quot;most significant half decade in the history of the game.&quot; The era was notable for the remarkable individual feats of Hank Aaron, Lou Brock, and Nolan Ryan, among others. It also presented one of the best World Series of all time (1975), including still the greatest World Series game ever played (Game Six). New York: Simon & Schuster, 1977. Hardcover. Very Good. Rep. Very good plus. Writing inside cover. Please Note: This book has been transferred to Between the Covers from another database and might not be described to our usual standards. Please inquire for more detailed condition information. New York: Popular Library, 1978. First Thus? Printing. fair to good. wraps, illus., covers somewhat worn Firsthand accounts of the heroes of modern baseball: Catfish Hunter, Pete Rose, Tom Seaver, Hank Aaron, Nolan Ryan, Reggie Jackson, Joe Morgan, Luis Tiant, and others. NY: S and s, 1977 Very Good/Very Good. Bison Books, 2004-03-01. Paperback. Good. SIMON & SCHUSTER. GOOD TORN DJ/COVER. HARDCOVER W/JACKET. Fireside. Used - Good. Good condition. Slightly dampstained. Bison Books. Used - Good. Good condition. Writing inside. Fireside. Used - Good. Good condition. Warner Books Inc, 1983-04. Paperback. Good. New York, NY: Popular Library. Good. 1978. No Edition Stated. Soft Cover. 4 1/8" x 6 7/8" 0445041994 PAPERBACK How baseball is played, and the place it occupies in our national consciousness. Has heavy wear at edges, creases on book, rubbed. .
Warner Books Inc. Used - Very Good. Great condition for a used book! Minimal wear. Warner Books Inc. Used - Good. Good condition. Popular Library, New York: 1978. Softcover. Reading copy. Cover has dirt marks and discolored pages. An unmatched and unmatchable account of not merely how baseball is played, but the place it occupies in our national consciousness. ISBN: 0445041994. Simon & Schuster. Used - Acceptable. No dust jacket. Very Good or better condition. Simon & Schuster, 1977. Hardcover. Acceptable. Disclaimer:A readable copy. All pages are intact, and the cover is intact. Pages can include considerable notes-in pen or highlighter-but the notes cannot obscure the text. An ex-library book and may have standard library stamps and/or stickers. 1983-04. Paperback. Good. Softcover. In Stock ships immediately. Stated First Warner Books Printing, 1983. Cover is in good condition with normal shelf and use wear. Pages have yellowed over time. Tight Binding. Clean unmarked text. No highlighting or pen/pencil markings. We ship daily. Touchstone, 1988. Paperback. Acceptable. Disclaimer:A readable copy. All pages are intact, and the cover is intact. Pages can include considerable notes-in pen or highlighter-but the notes cannot obscure the text. At ThriftBooks, our motto is: Read More, Spend Less.Dust jacket quality is not guaranteed. NY: Simon & Schuster, (c1977). Blue cloth.. 8vo. Simon & Schuster, 1977. Hardcover. Acceptable. Disclaimer:A readable copy. All pages are intact, and the cover is intact. Pages can include considerable notes-in pen or highlighter-but the notes cannot obscure the text. The dust jacket is missing. At ThriftBooks, our motto is: Read More, Spend Less. Simon & Schuster, 1977. Hardcover. Good. Disclaimer:A copy that has been read, but remains in clean condition. All pages are intact, and the cover is intact. The spine may show signs of wear. Pages can include limited notes and highlighting, and the copy can include previous owner inscriptions. An ex-library book and may have standard library stamps and/or stickers. At ThriftBooks, our motto is: Read More, Spend Less.Dust jacket quality is not guaranteed. Simon & Schuster, 1977. Hardcover. Acceptable. Disclaimer:A readable copy. All pages are intact, and the cover is intact. Pages can include considerable notes-in pen or highlighter-but the notes cannot obscure the text. At ThriftBooks, our motto is: Read More, Spend Less.Dust jacket quality is not guaranteed. Touchstone, 1988. Paperback. Good. Disclaimer:A copy that has been read, but remains in clean condition. All pages are intact, and the cover is intact. The spine may show signs of wear. Pages can include limited notes and highlighting, and the copy can include previous owner inscriptions. At ThriftBooks, our motto is: Read More, Spend Less.Dust jacket quality is not guaranteed. NY. Fireside/Simon & Schuster (1988). Trade Paperback. Front cover scored along spine, else Near Fine. 8vo. Events & ancedotes from the 1972-1976 seasons. Condition: Front cover scored along spine, else Near Fine. New York: Popular Library, 1978 Hint of page toning. Otherwise a clean, tight copy with an uncreased spine. Includes Angell's classic essay on the 1975 World Series.. Mass Market Paperback. Very Good/No Jacket as Issued. Simon & Schuster, NY,, 1988. Paperback. (Very Good or better unless otherwise noted). Simon & Schuster, NY, 1988, 413p., Paperback. Fireside. Paperback. GOOD. Spine creases, wear to binding and pages from reading. May contain limited notes, underlining or highlighting that does affect the text. Possible ex library copy, thatâll have the markings and stickers associated from the library. Accessories such as CD, codes, toys, may not be included.